The children have been very creative this week: Class 1 and 2 and Reception have been producing some fabulous firework art and craft; Class 3 and 4 have drawn some impressive Celtic designs and Class 5 and 6 have been reading and writing WW1 poems. Dame Tipping is now the proud recipient of the Sainsbury’s School Games Bronze award, in recognition for all the sports we are now taking part in. Thank you to everyone who has helped us achieve this, especially Mrs. Potts and Mrs. Davies. The children are taking part in cross country sessions for PE over the next few weeks. Please provide your child with a pair of trainers (preferably old ones), spare socks and a plastic bag to put wet items in, as we cannot guarantee your child will not get wet. 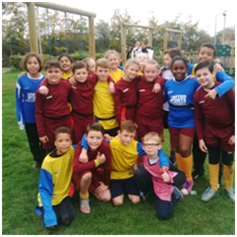 Once again, our children did us proud at the Tag Rugby Tournament and Festival. Their behaviour and attitude were exemplary, and they played very well. Both teams won games in their heats, and the festival team reached the quarter finals. Well done! 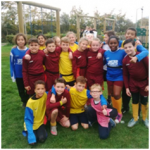 Our Year 5 and 6 football team did a great job at the last tournament. The team won 3-2 against Parklands; 2-0 against Brady; drew 0-0 against Oakfield and lost the other 3 games. The team are constantly improving and have a great attitude to their game. Next Friday, the children (and staff!) can come to school in their pyjamas, if they bring a gold coin (£1 or £2) for Children in Need. Please send your child in warm pyjamas and a coat, as they will still be going out to play and years 4-6 will be going swimming. There will also be a cake sale (more details to follow). This event has been organised by the School Council and was voted for by the children. Please see below for a breakdown of the responses to the Parent Questionnaire carried out before half term. The responses were very positive, but we have taken on board comments and suggestions for improvement and will be acting on them in the near future. The pupil questionnaire was also very positive. The 2 areas where the some children felt we could improve were behaviour and the school listening to them. We are working on this through the school council and will be running workshops and activities in which the children can have further input into the behaviour policy. A parent was almost run over outside school one morning this week. This was because a car backed out across the path at the end of the lane. If this had been a young child, they would almost certainly have been seriously injured. It may be necessary for parents to back up into the car park if someone is coming in from the road. While this may be inconvenient, it is far safer than forcing someone to back out onto the main road. The forms for the flu jabs were collected today. If you did not return your form, you can still bring them in on Monday next week. If someone unknown to the school is going to pick up your child, please make sure you introduce them to Mrs. Wakeman in the office or the class teacher or TA in advance. If this is not possible, we will need to use a password, so please ensure that you call the office and speak to someone in person. Please do not bring dogs into the school building and please ensure that you keep them on a lead on the school grounds. Some children can be frightened by dogs and we do not wish to cause them any unnecessary anxiety. Don’t forget to sign your children up for our mixed Year 3-6 football club. The cost is £15 per half term. We would love to see more girls join in. Please note that this club (Wednesday 3-4pm) is not open to Year 5 and 6 boys already in the Tuesday Football club/team. There are 12 places available. I am delighted to announce that Lorraine Shorter has been voted in by the parents as our new Parent Governor. She will begin her duties at the Full Governing Body meeting next week. Thank you to Sarah Bimpong and Jason Wapling for also standing, and to all parents who voted. Reception- 94.29%; Class 1 and 2- 97.33%; Class 3 and 4- 97.93%; Class 5 and 6- 94%. Commendations this week went to William Smyth, Maisie Randall, Krishaan Chagger, Elena Marshall, Abigail Lee, Coral Stoker and Katie Snow. The Class 5 and 6 Work of the Week certificate goes to Joe Stanley, who completed some excellent Maths work. Class 1 and 2 Work of the Week went to Milo Shorter, who wrote a fabulous story based on Mrs Armitage on Wheels. Joe Stanley also earned his pen licence this week for consistenly neat, joined writing. Well done, Joe. Scarlett Blackshaw has been invited to train at Chelsea FC Youth development centre in Surrey next week. We look forward to hearing all about it and wish her every success there. Well done to Amber Gordon, Scarlett Kedadi (x2), Scarlett Clarke, Aimee Bradley, Michael Battrum and Kaci Peart for earning their place in the Gold Book. They have all displayed excellent learning behaviour.